Never waste tags again! Tag size: 13/32" x 3.4". Custom Nowaste® shirt tags available. 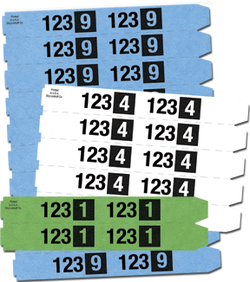 Tags can be made with store, route or lot numbers printed on both ends. Piece size 6-10 require a minimum and multiple of 2 boxes. Allow 45 days for production. A multi-purpose tag designed to make identification quick and easy. Available with and without Major #s, the Jumbo-7 with its extra large numbers makes it easy to designate a branch, lot, route and even a promised day. Padded in sets of 50 - 7,000 tags per box. Tag size: 13/32" x 3.4"
Minor numbers 0-999 in each box. Padding available upon request (padded in sets of 50) for an additional charge of $2.00 per box. 7,000 tags per box. Tag size: 13/32" x 3.4"
Shirt tags can be made at no extra charge with other "major" designations or special printing. Minor numbers 0-999 in each box. Padding available upon request (padded in sets of 50) for an additional charge of $2.00 per box. 9,000 tags per box. Tag size: 13/32" x 3.4"